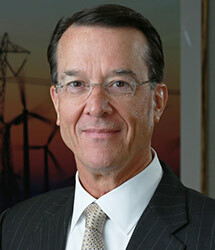 Theodore F. Craver, Jr., is the former chairman, president and chief executive officer of Edison International, the parent company of Southern California Edison, one of the nation’s largest electric utilities, and Edison Energy Group, a portfolio of competitive electric businesses. Craver was elected chairman and chief executive officer in August 2008, and president in April 2008, and retired in September 2016. Prior to becoming CEO of Edison International, Craver was CEO of one of Edison’s principal subsidiaries, Edison Mission Group (2005-2008), and CFO of Edison International (2000-2004). Craver is currently a non-executive director and chair of the Audit Committee of Duke Energy, the nation’s second largest electric and gas utility holding company. He was appointed a non-executive director of Wells Fargo & Company effective January 2018 and chairs the board Finance Committee. Craver is also Senior Advisor to Blackstone’s Infrastructure group and Senior Advisor to Bain & Company’s Industrials practice. He is a member of the Economic Advisory Council of the Federal Reserve Bank’s 12th District. Before joining Edison in 1996, Craver served as executive vice president and corporate treasurer of First Interstate Bancorp from 1991 to 1996, where he was responsible for corporate development, treasury, and investment and insurance products. Craver also served as executive vice president and chief financial officer of First Interstate’s wholesale banking subsidiary from 1986 to 1991. Before First Interstate, he spent four years with Bankers Trust Company of New York and seven years with Security Pacific National Bank in various capital markets sales and trading roles. Craver serves on the Board of the Smithsonian National Museum of American History, the Board of the Autry Museum of the American West, and the Executive Board of the Western Los Angeles County Council of the Boy Scouts of America. Craver earned an MBA and a bachelor’s degree in economics and international relations from the University of Southern California.